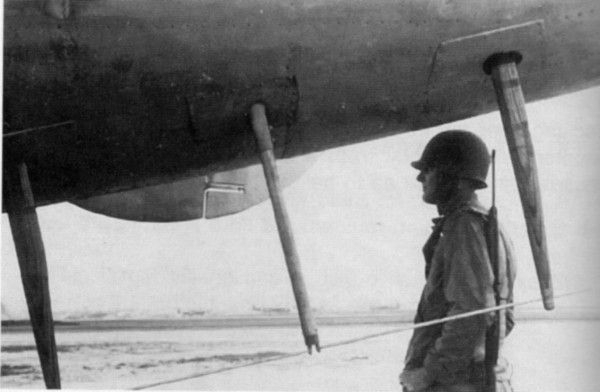 The Azon Bomb consisted of the tail fin unit [pictured above] being bolted to a 1,000-pound GP bomb. Four were usually carried, and the altitude was determined by weather conditions in the target area. Normally, about 15,000 feet was required to apply adequate controls for the missile. Crews were subjected to many alerts only to have a last-minute scrub because of weather. Only seven of the sorties were considered successful, however, Azon is the father of “smart bombs” in use by military forces today around the world. Therefore, a label of success must be applied to the total project, if not in terms of quantity, then most certainly one of quality. To a man, the crews are proud of their all-out efforts for even a limited achievement. The ten Azon aircraft and crews were en route to the CBI Theater when they were diverted to the ETO for bridge and dock missions as D-Day pre-invasion operations. They went to Rackheath, home of the 467th BG, first, remained one day, then on to Horsham. Training in local flight conditions and procedures began and continued for most of May, 1944. Seven of the original ten aircraft met a grievous fate after the project was terminated in September. Some of the crews left the program before it ended to fly regular combat missions with the [753rd] Squadron. Most of the crews survived the war, although individual members and one crew did not. Lt Jones and his crew were shot down over Holland 11 July 1944 while returning from a mission on Munich, Germany, and from his crew three gunners were never accounted for, another evaded capture and returned to base while four were POW’s until the war’s end. Other Azon pilots volunteered for the top secret “Operation Aphrodite” project which was using the Azon unit to control crewless, explosive-laden B-17’s as radio controlled drones (pilots flew the B-17’s part way, then the “mother ship” B-24’s assumed radio control) to destroy selected targets in France. It was an unsuccessful venture of short duration. Those known to be involved were: Majors Holbrook and Rand, Captain Wilfred Tooman, and Lieutenants Larned and Hargis. Some enlisted technicians also served in the project while on detached services from the 753rd Squadron. 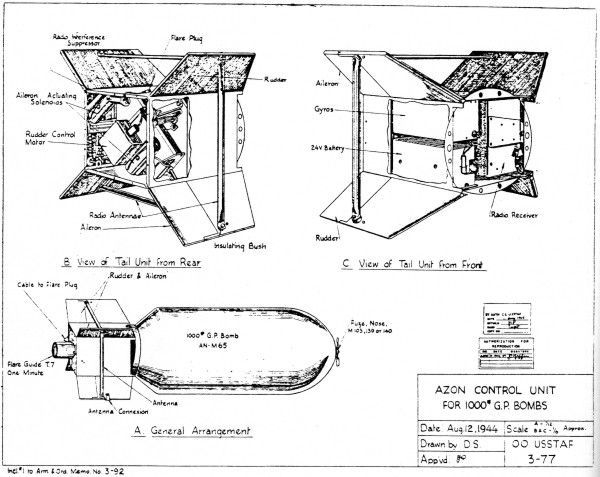 The Azon (AZimuth ONly) unit consisted of remote controlled fins attached to a 1,000-pound General Purpose bomb, and bombardiers altered the bomb’s trajectory in flight with radio signals which moved the fins. Also, a collar was added to its midsection for additional control. Elevators were attached to the collar similar to preset trim tabs on the control surfaces of aircraft. The elevators created a stabilizing effect on the falling bomb, allowing more ease in altering the missile’s azimuth. Gyros prevented a weaving effect of the bomb as various corrections were made. Compressed air kept the gyros spinning during the time of the fall. The radio system was powered by a dry cell battery whose life was about three minutes – more than enough to exceed time for a thousand pound bomb to strike a target. Additionally, a smoke generator marked the bomb’s flight path. It produced a streamer of red, white, or green (yellow was added later) to distinguish between individual bombs being controlled. The bomb only had one fuse -- in its forward end. Settings for the fuse were instantaneous. Difficulty had been encountered early in the development stages using as little as one second delay, accounting for almost as many duds as explosive bombs. This created disadvantages in some types of targets where a delay fuse would have a more destructive force – as in the armor-like surface of bridge spans or concrete construction. But it did add a security factor, deemed necessary, in that the secret weapon would more likely be destroyed on contact rather than fall into enemy hands intact. The Azon control system was designed to correct deflection errors, and testing indicated this could potentially be reduced to zero. But it would not improve range errors. Experience was said to have shown (in the latter stages of the program) that bombardiers were inclined to be a little careless in solving range problems. Alternately, some bombardiers claimed the ability to shorten an Azon bomb’s flight, but few, if any, boasted of extending one’s range. Weight of the control unit was only 96 pounds. However, bulkiness of the fins and collar on an assembled bomb made it too large for transporting in the standard 1,000-pound bomb racks. Thus, the aircraft had to be equipped with 2,000-pound bomb racks, and this normally limited the number they were able to carry to four. On some occasions, however, five and even six were transported. Each aircraft had three antennas mounted beneath its tail section for control purposes. One transmitted a signal on 475 cycles for left deflection, one on 3,000 cycles for right deflection, and the third at 30-40 cycles to activate the smoke generating system. All three frequencies were changed periodically to prevent jamming by enemy radio monitoring crews. 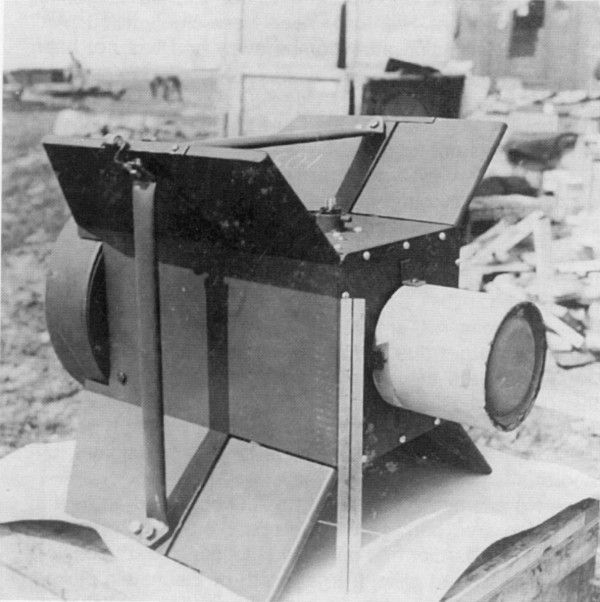 The transmitter was a standard Signal Corps type used in controlling model planes, ships, tanks, and drones. With a power output of 25-watts, the unit was capable of sending on 15 different frequencies. This equipment weighed 33 pounds, and modification to the B-24, for accommodating it, amounted to an additional 25 pounds. Major Robert K. Holbrook was in charge of the ETO Project, and his assistant was Leiutenant David M. Baltimore. Major Henry J. Rand and Mr. Thomas J. O'Donnell invented the Azon bomb and saw it through testing, production and its actual use in combat situations. Article reproduced here with kind permission of the author. AZ10 ?-Jun-44 -- NO RECORD - SCRUBBED? MISSION OF 31 MAY 1944 (AZON No.1). Inasmuch as this is the first mission of its type in which this squadron participated, it is being included in the June, rather than the May, summary of operations. The following five targets, all bridges, were assigned the squadron, attacks to be made in the order that the targets are named: Melun, Verberie, Precy, Beaumont, and Mantes-Gassicourt. Five aircraft, piloted by the following officers, were to participate: Lieutenants Shaw, DeNeffe, Larned, Tooman, and Lansing; Major F.M. O’Neill riding with Lt. Tooman was command pilot. Five groups of P-51’s (48 aircraft) as fighter support had been especially briefed for this mission, and on making rendezvous with the bombers were to give each bomber a supporting force of eight aircraft per bomber, with eight more aircraft on top giving general support. Bombing methods were to be by individual ships in trail, stepped up 200 feet each and from an altitude of 17,000 feet to 17,800 feet. Bombing results were unfortunately not satisfactory. Only four aircraft of the original five dispatched, arrived over the targets. Lt. Shaw being forced to abort because of mechanical difficulties. 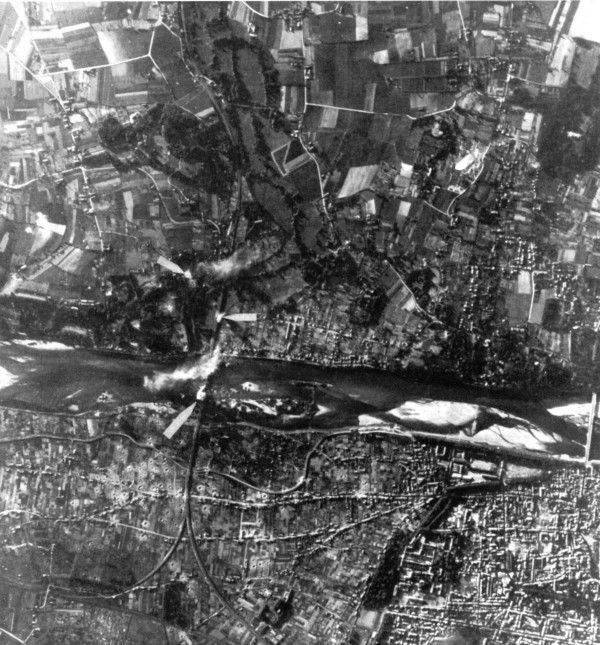 Target Number 1 (Melun) was attacked by three of the remaining aircraft, and two of the bombs fell on the northeast side of the river. SAV (Strike Attack Vertical photograph) picked up two of the three bombs released and revealed that they fell within 2,000 feet of the MPI. Target Number 2 was not attacked because of cloud coverage. Target Number 3 was attacked by two aircraft, but no SAV’s were obtained. Interrogation of crews revealed that one bomb fell short and the other hit southeast of the bridge about 300 feet from the MPI. Target Number 4 was attacked by four aircraft with good results, bombs hitting in the center of the bridge and on tracks at the north end of the bridge. Three aircraft attacked Target 5 and all three bombs were placed in the 1000 foot circle as shown by SAV. 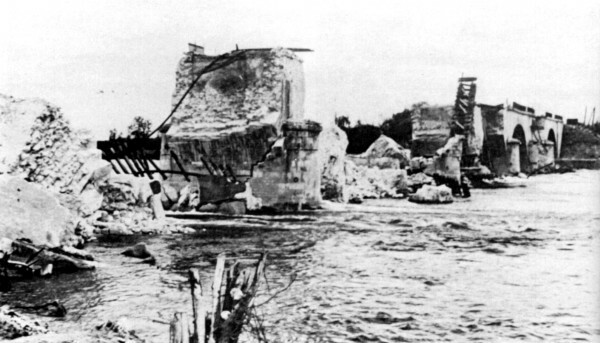 A target of opportunity (bridge at Meuhlan) was attacked by one aircraft with poor results. No enemy opposition was encountered and only meager inaccurate flak was sighted at one point. Weather prevented successful execution of the mission, cloud cover varying from five to ten tenths around all targets, obscuring most of them and making bomb runs difficult. AZON No. 2 1 June 1944. Three tactical targets were assigned to the outfit for today's mission, but the operation was scrubbed prior to briefing. AZON No. 3 4 June 1944. Today’s operational mission called for attacks on two tactical targets; the first a railway flyover and double line junction at Melun, France, and the second an embankment and bridge over the Seine River at Melun. Six aircraft were dispatched and flown by the following pilots: Lieutenants Griffith, DeNeffe, Larned, Tooman, Shaw, and Lansing. Major O’Neill in Lt. DeNeffe’s ship was again flying as command pilot. Lt. Griffith’s ship was forced to abort after being dispatched but before reaching the target due to hydraulic lines being [put] out by flak fifteen miles inside enemy territory. A malfunction in the bomb rack of Lt. Larned’s ship caused three of his bombs to release at La Ferte, none being dropped on either target. Target No. 1 was attacked by the remaining four aircraft with all four bombs hitting short an estimated range of from 200 to 1000 feet. The same four aircraft then proceeded to Target No. 2, all of them attacking and one ship dropping three bombs. Two crews reported near misses, possibly damaging the bridge, but the remainder of the bombs were off in azimuth. No photo coverage was had on either target. Flak was moderate and accurate from a battery of twelve to fourteen guns located about 1,000 yards south of Grandcamp. Defenses at the A/D at Bretigny offered about the same opposition. Enemy aircraft opposition was nil. AZON No. 4 8 June 1944. Fifteen A/C took off on today’s mission, but abandoned the operation at 0845 hours, position 4925N…0030W, due to unsatisfactory weather conditions and the lack of fighter support. AZON No. 6 14 June 1944. Fifteen A/C took off in three sections of five each. Numbers One and Two Sections remained together, attacking assigned target No. 2 (Hanim). Number Three Section flew alone, attacking an unidentified target of opportunity. Targets One, Two, Three, Four, and Five were obscured by cloud, which prevented bombing. Ten A/C flew over Target No. 2, seven of them attacking; ships 408 and 141 failed due to malfunction, and 431 due to being too far off course. An additional ship reported that, although he dropped, he was so far off course that it was impossible to bring his bomb closer than 800 feet from the target, even with maximum correction. Section No. 3 was on course to [the] I.P., but after that they were apparently lost, and made exit from enemy territory seven miles east of Calais. All five ships attacked a target of opportunity identified as St. Omer, Bethune, Aire, or 5050N-0158E. A/C 285 dropped bombs at the last point by mistake. Of thirteen bombs dropped, only one could have had damaging effect. This fell 600 feet short of the center of the bridge at Hanim, landing on the tracks. The trestle leading up to the bridge probably extended back that far. Enemy A/C opposition was nil, and flak encountered was meager to moderate in intensity, continuous following type, and fairly accurate. AZON No. 7 15 June 1944. Fourteen AZON crews were assigned three targets today: Etaples, Peronne, and Doullens, all of which were railway bridges in France. Eleven A/C attacked Target No. 1, seven Target No. 2, and only six attacked the third target. The overall results should be considered fair to good. Target No. 2 was destroyed by direct hits, and Nos. 1 and 3 were severely damaged by several near misses. Bombing altitude was 21,000 feet, which is unusually high for an operation of this type. No enemy A/C were encountered, but about one hundred were observed in an open field on both sides of a canal at 4915N-0012E. The formation flew over two heavily defended areas without being fired on. Flak was encountered, however, at Etaples and Doullans, being classified as meager and inaccurate to fair. 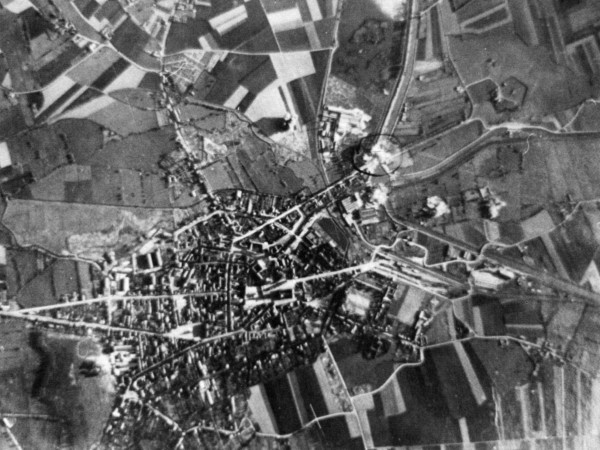 Defenses at Frevent offered slight opposition, but at Caen, although the flak was moderate, it was extremely accurate. Six aircraft received minor battle damage and one major. AZON No. 8 18 June 1944. Today’s mission was scrubbed. AZON No. 9 22 June 1944. Ten aircraft from this squadron were dispatched to attack bridges at Saumur and Tours, in France. Nine planes reached the target, one being compelled to abort due to mechanical difficulty. This was the most successful operation in which the outfit has participated. 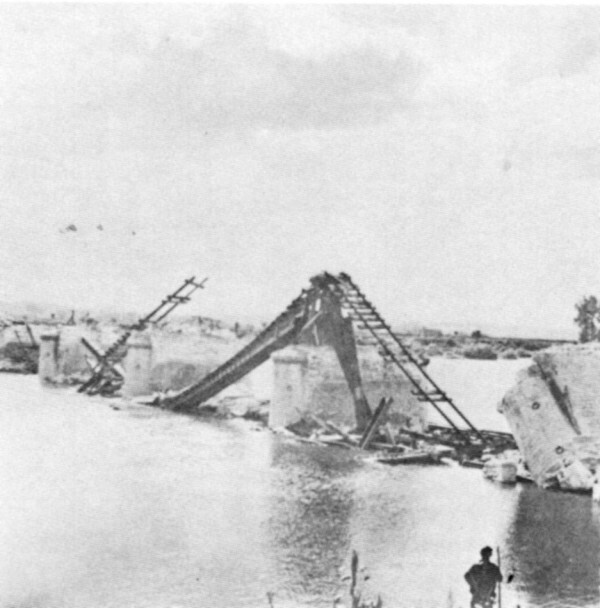 Both bridges were rendered useless to the enemy by well-placed and direct hits. No enemy aircraft were encountered. Moderate continuous following flak was put up at La Havre, but it was inaccurate and ineffective. At Tours, however, the flak was moderate and accurate. Nine of the ten aircraft dispatched suffered battle damage. SAV on both targets reveal excellent results. 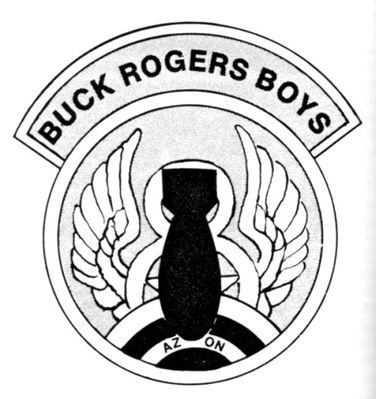 This month marked the first anniversary of the activation of this squadron on 28 July, as well as that of the 458th Bombardment Group. The occasion was not observed by the squadron apart from the Group birthday party, which recognized also the completion of one hundred combat missions on 20 July. Inasmuch as the greater part of our aircraft were being held in reserve for tactical missions adapted to Azon technique, the squadron did not figure prominently in the Group’s operations during the first part of the month. A number of AZON practice missions were run to familiarize our crews with AZON bombing, although no AZON missions occurred. On the sixteen missions completed by the Group this month, our squadron chalked up a total of 71 sorties, out of 387 for the group. Major Frederick M. O’Neill, Squadron Commander, led the group on July 11th, when the Munich/Riem airfield was attacked by PFF with unobserved results. One of our aircraft, A/C #341, piloted by 1st Lt. John J. Jones [AZON crew 02], did not return from this mission. After being hit by intense flak over the target, Lt. Jones’ aircraft was seen to leave the formation and disappear into the undercast thirty miles inside enemy territory, near Neuzen, Netherlands. One engine was feathered and another was sputtering. At the same time a radio message was picked up, presumably from the same aircraft, asking for the position. The crew members were the following: 1st Lt John J. Jones, 1st Lt William R. Joyce, 2nd Lt Phil Z. Cole, S/Sgt George L. Eifel, S/Sgt Jake T. Lucero, Sgt Charles E. Stenard, Sgt Robert A. Palmer, Sgt Mitchell A. Kamenski, Sgt Clarence M. Prentice, and 2nd Lt O.R. Hammersmith. A non-stop pounding of assorted Nazi targets opened the month of August and continued for eighteen days, during which eighteen missions were flown. If we include the last day of July, the figure is nineteen missions in nineteen days. After a lull because of poor weather, the assault was renewed, with seven more missions being chalked up in the four day period 24 – 27 August. Three AZON missions flown exclusively by the 753rd Squadron are included in this tally. 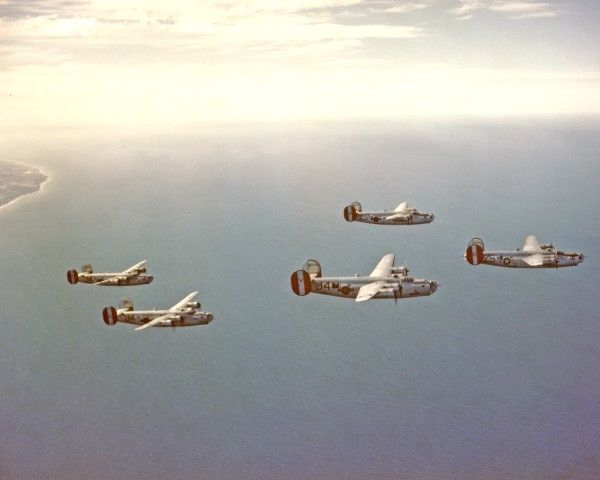 Of 546 sorties credited to the Group this month, 753rd crews claim 131. The fact that a part of our crews and aircraft were devoted primarily to AZON experimentation and operations, limited our contribution to the normal Group operations. Major John A. Hensler, Squadron Commander, led the Group on two missions: to the “Noball” areas on 2 August, when he piloted the GH aircraft, and to Vechta Airfield on 15 August. The Commanding Officer also commanded the force sent out on two AZON missions – to Esternay, France on 17 August and to Moerdijk, Netherlands on 26 August. Capt. Frank E. Wright, Operations Officer, flew as Command-Pilot on one AZON mission and four others, including the highly successful attack on Rostock on 4 August. On four missions, Capt. Maurice E. Speer flew as Command–Pilot. None of the three AZON missions completed this month was successful with regard to bombing results. On 17 August, ten crews were briefed to attack a railroad bridge at Les Foulons, near Esternay, France (AZON No. 11). Because of a complete undercast at the target, no bombs were dropped. The second target for AZON, on 25 August, was the bridge at Moerdijk, Netherlands (AZON No. 12). Two flights of five aircraft attacked the target, dropping a total of 40 X 1000 HE bombs from an altitude of 16,000 feet. Photo Reconnaissance revealed some near misses, but no direct hits. [Strike Photo 1] [Strike Photo 2] No flak nor fighter opposition was encountered. The third AZON mission (AZON No. 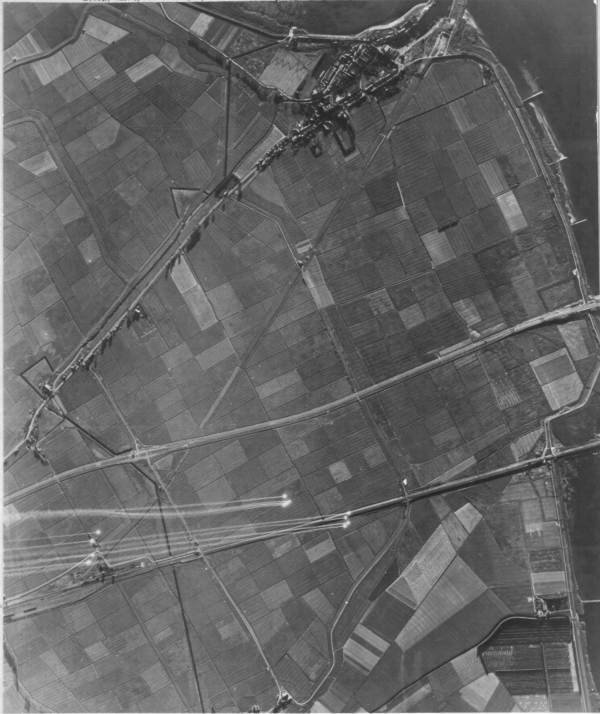 13), 26 August, was to have attacked the Moerdijk Bridge a second time, but bombing was prevented by cloud cover. There was no fighter opposition or flak at [the] target, but flak at Gilze-Rigen A/F resulted in minor damage to six aircraft and major damage to one. Nine aircraft participated. Since the last twenty days of September were devoted to “Truckin’” Operations, in which the group ferried 727,160 gallons of gasoline to the armored units of the Third Army in France, only five combat missions were executed by the Group during this month, to which the 753rd contributed seven aircraft. The majority of our aircraft were equipped and held in readiness for AZON operations, two AZON missions being flown in September. On the first day of the month (AZON Sortie No. 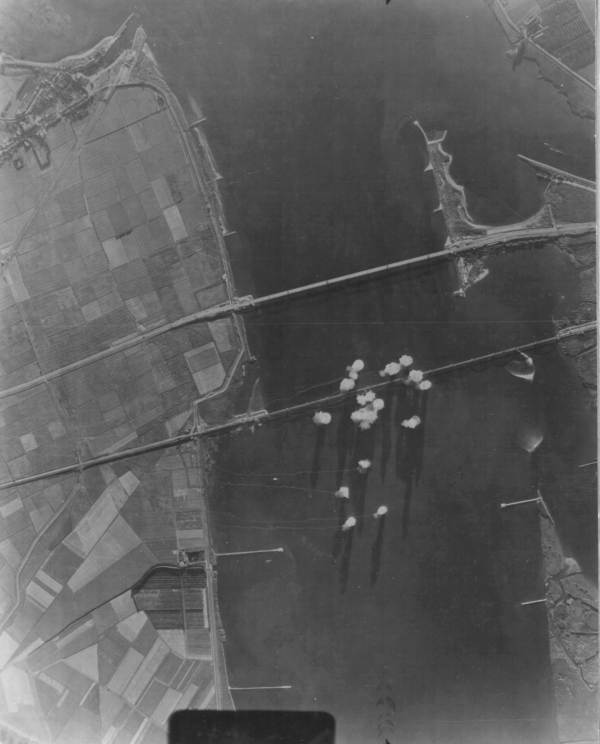 14) two sections of six AZON aircraft each attacked the bridge at Ravenstein, Holland, 5148N-0539E, dropping a total of 24 X 2000 HE bombs from a mean altitude of 16,500 feet and scoring near misses on the bridge, the west approach, and minor roadways. No enemy aircraft or AA gunfire was encountered. AZON mission No. 15 briefed on 5 September was scrubbed. AZON Sortie No. 16 was flown on 13 September, eleven aircraft being dispatched to attack the oil refinery at Hemmingstadt (near Heide), Germany, with a large ammunition depot at Kropp, Germany (near Pendsburg) as the secondary. Five A/C attacked the primary target, dropping a total of 25 X 1000 pound GP bombs, which hit 700 to 800 feet short of MPI. Cloud which was encountered during [the] last ten seconds of [the] bomb run, interfered with sighting. Six planes attacked the secondary from an altitude of 16,000 feet dropping 25 X 1000 pound AZON bombs and 5 X 1000 [pound] GP bombs. Some hits in target area, were observed with fires started, but most of the bombs fell short. No battle damage or casualties were suffered. To the other combat missions of the Group, employing 137 aircraft, this Squadron contributed seven aircraft. The months of October and November saw the abandonment of AZON operations and the full participation of this Squadron in the Group missions. Of the twenty-five missions completed in this period, the 753rd contributed 201 aircraft to the 748 placed over enemy targets by the Group.